The wonderful community at freedible is gathering recipes to help "bring everyone back to the table" for Thanksgiving. So far, I have not come up with any recipes to contribute, but I am thankful to those who are sharing their recipes. If you have any "Custom Eater"-friendly recipes, please consider popping over there to share! When I read about this campaign, it really touched me, as I do want to make a concerted effort to provide a table full of foods that my daughter can choose from and not feel like everyone else is eating something different from her. In our family, we have various dietary needs and I often can't eat what she is eating and she can't eat what I'm eating, but on this occasion, I'm going to find the common ground, so she can see uniform plates all around! (ETA: We don't eat my daughter's major allergens in our home, but we eat things that she doesn't like (she's not a fan of "mixed" foods) or foods that have not been cleared as safe, due to cross-contact, etc.) Being that she just turned 5, she might not be all that concerned about having the exact same thing, but I have noticed that she looks for a link between her plates and ours, at meal times. We often share a common vegetable or something, and she will note, "I'm having carrots, too!" So, she might not need *everything* to match, but I want to have as much to match as I can. This can be a very stressful time of year, for those of us with food allergies and dietary restrictions, so I wish everyone as much peace as can be had! 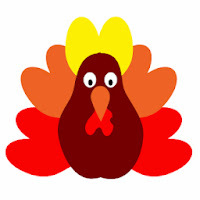 Happy Thanksgiving from Amazing & Atopic!